C. Plautius C.f. was one of the moneyers for the year 121 BC. He is not otherwise known. Gens Plautia, sometimes written Plotia, was a plebeian family at ancient Rome. 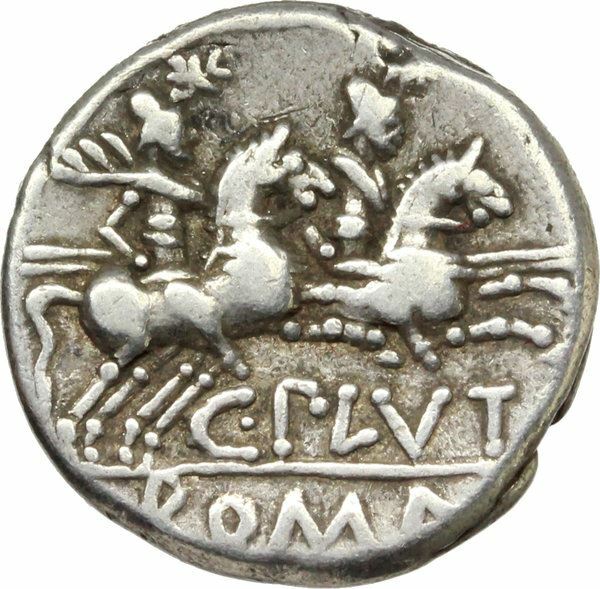 Members of this gens first appear in history in the middle of the fourth century BC, when Gaius Plautius Proculus obtained the consulship soon after that magistracy was opened to the plebeian order by the lex Licinia Sextia. Little is heard of the Plautii from the period of the Samnite Wars down to the late second century BC, but from then to imperial times they regularly held the consulship and other offices of importance. The nomen Plautius is derived from the common Latin surname Plautus, flat-footed. In the first century AD, the emperor Claudius, whose first wife was a member of this family, granted patrician status to one branch of the Plautii.